*The coupons for product redemption, information, and gift card have been provided by Entenmann’s® Little Bites® so that I could try the product and share my thoughts and information about Entenmann’s® Little Bites®. The opinions expressed in this post are my own and do not reflect the opinions of Entenmann’s® Little Bites®. After school is like a frenzy for us. We come in and immediately, my kids are looking for snacks. I’ll be honest with you, after a long day of being apart, I have missed them! One of their favorite treats are Entenmann’s® Little Bites®. For my family, Entenmann’s is a house hold name that my husband and I grew up enjoying. I am so glad that my children now can enjoy these little treats after school and in their lunch boxes. Because life can get stressful and busy sometimes, I believe in celebrating the little moments with my little ones. Entenmann’s® Little Bites® latest seasonal flavor is Chocolate Party Cake! Overflowing with flavor to treat the taste buds of all chocolate lovers, these new Chocolate Party Cakes are complete with rainbow sprinkles, similar to the fan-favorite original golden Entenmann’s® Little Bites® Party Cakes. Entenmann’s® Little Bites® contain no high fructose corn syrup, are made with real ingredients, certified Kosher, and are less than 200 calories per pouch. Chocolate Party Cake are available nationwide for a limited time only from 1/14/17 to 5/20/17. One of our favorite ways to enjoy Entenmann Little Bites is with some Hot Chocolate, like this delicious recipe for Party Cake Hot Chocolate! 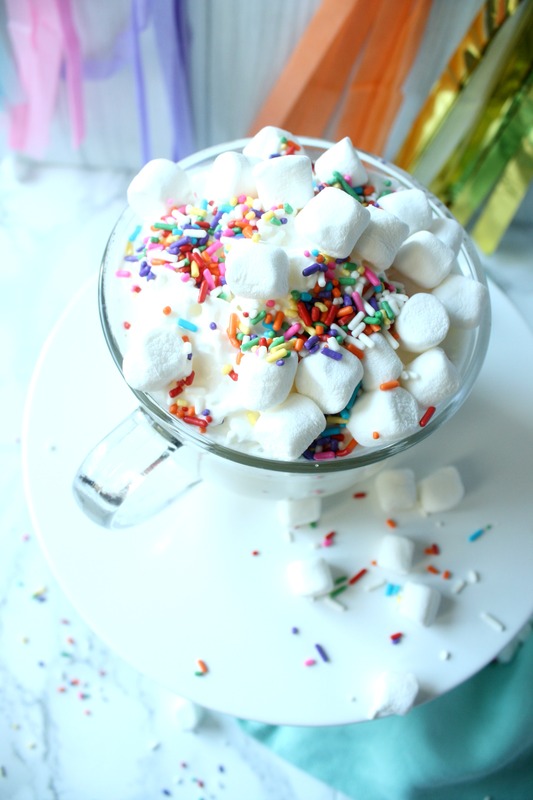 Perfect for a chilly day, this Party Cake Hot Chocolate will hit the spot! In a small pot, add first four ingredients together. On low heat, melt the chocolate in the milk. Be sure not to burn chocolate or milk. Whisk together until it is a creamy texture. We enjoy our Party Cake Hot Chocolate with the new Entenmann’s® Little Bites®! I am hosting a giveaway for one reader to receive three coupons, each valid for $5.00 off the purchase of Entenmann’s® Little Bites®, and a $25 Visa gift card to purchase additional Entenmann’s® Little Bites® Chocolate Party Cakes! The giveaway will end on 2/9/17 at 11:59p ET and is open to US Residents, 18+, one entry per household. Good luck! I have always loved the Brownie Bites! I really love the blueberry muffin ones! So yummy. I love the little bites crumb cakes! They are so yummy! We love the brownie bites yummy! Definitely the brownie bites! They are the best. Oh yum the brownie bites are fantastic! They cant be beat! I like the chocolate chip mini muffins best. Chocolate chip muffin little bites are my favorite. My favorite are the Little Bites Chocolate Chip Muffins – Yum. What a delicious treat idea! Perfect for a party! I would use dark chocolate chips in the cocoa because I’m not a fan of white chocolate. It looks very festive and fun! I like the coffee cakes. I want to try the butter cookie muffin. I’ve heard great things, but never actually tried them myself. I’d love to try the Butter Cookie Muffins! Love that set up with the ribbons – so festive! We love the Little Bites® Fudge Brownies. All of them are so good! I love the Little Bites Crumb Cakes! I like the blueberry muffins and the chocolate chip muffins. These bites look yummy and I like the Hot Chocolate recipe. I have to give it a try. My favorite are the Little Bites Fudge Brownies. I love the real chocolate chip Little Bites. That’s the perfect pair with coffee or later in the day for a pick me up. The marshmallows and sprinkles combo has such a festive look. I’d love to try them myself. Thanks for posting! The hot chocolate looks good. I love all the marshmallows on top. The Little Bites Crumb Cakes are my favorite. I really like the butter cookie muffins! The snicker doodle muffins look yummy but the blueberry are my favorite. We like the chocolate chip bites, but these party bites look really good too. We tried the Butter Cookie mini bites. My kids really liked them. Brownie bites…even though I shouldn’t eat them! I think the fudge brownie would be a great one. The Party Cake Hot Chocolate doesn’t seem so hard to do; I have to try this. Its real chocolate so hopefully I can’t mess it up. This looks yummy! I am making this as soon as I can get the stuff at the store when this weather breaks. Butter cookie muffin I would love to try. Also, I already love blueberry. I can’t even tell you how delicious this looks! Thank you so much for sharing– I can’t wait to try! I’ve only ever had the chocolate chip, which I love but now I will have to try the others. I think a new favorite would be the crumb cake ones. Mmm. My favorite is Chocolate Chip. Yummy! Thanks for the giveaway. This looks delicious. I cannot see any one disliking this recipe. Thanks for the information. Hot Chocolate and Entanmann’s Little Bites what a great combination. Yummy!!! Love your hot chocolate recipe!!! I have always liked the little bites coffee cakes! yum! I’ve had these, LOVE the blueberry ones! My kids and I love the chocolate chip,so yummy!!! We really like the Little Bites Snickerdoodle Muffins, also the Seasonal Little Bites Cinnamon French Toast Muffins! My favorite flavor would be those yummy brownie bites. The Blueberry are my favorite! I love the crumb cakes! Yum… yum… yum!! I like the fudge brownie big oacks. Love Crumb,my Favorite.Thanks for sharing. Sounds simple to make, looks delicious. I am sure it is very tasty. The Chocolate Chip Muffin Bites are my favorite! So hard to pick one favorite flavor! We love chocolate chip muffin and also the blueberry one too, they’re all so yummy! It goes quick in my home! I love their little bites crumb cakes! Can’t wait to try this out with my family! We all love marshmallows and sprinkles! I like the Brownie Lil bites. This hot chocolate recipes looks really good. The kids would love it. These are super yummy! I buy the Birthday Cake flavored muffin bites for my son all the time. What a delicious way to enjoy some family time. I love having little parties like this and that hot chocolate looks so tasty!! YUM! I really love the Little Bites® Blueberry Muffins snacks the best. This Party Cake Hot Chocolate looks so delicious. I will have to give this a try this weekend. We love our hot chocolate in our house. I wil have to make this Party Cake Hot Chocolate. I am sure it will be a big hit. I wish I could have a Party Cake Hot Chocolate right now. It looks so delicious and easy to make. The brownie bits would make it so amazing. This would be a great drink for winter parties! This looks so delicious! I have never thought to make a hot chocolate like this and my kids would love it. I love the cuteness of this gorgeous drink. My kids would love if I whipped this up at for a snack. I love to munch on the blueberry muffins. I think kids would love this party cake. My favorite flavor is Little bites crumb cakes. The Little Bites® Snickerdoodle Muffins may be my new favorite. This is what I need to help me relax. I am wound up a little too tightly tonight and this hot chocolate would help me unwind. No cookies or cakes for me, but for the rest of the family, banana should be the favorite. The Fudge Brownie is our favorite! Oh what a treat! We like those Entenmann’s Little Bites a lot. Having some with some delicious hot chocolate would be great. My girls would enjoy making this as much as they would having it to drink. This is my first time seeing this flavor of muffins. Will be looking for them! Yum this sounds great. My girls are loving hot chocolate lately and I think they’d love to do something like this! Nice to change it up every once in a while and this looks yummy! I LOVE their blueberry muffins little bites! Brownie Bites are the best! Little Bites Chocolate Chip Muffins would be my favorite. I like the chocolate chip muffins. Thanks for the chance. This looks amazing! I have some of the Little Bites too! I’ll have to give this recipe a try. I can’t wait to see how it tastes! We like the chocolate chip ones. My boys love the blueberry muffins. Okay, now I see how you made it. Sounds yummmmm! This looks delicious and SO fun! My kids will surely go crazy for this! I love the chocolate chip and the crumb cakes, they are both so good! My favorite item is the chocolate chip muffins. That sure does look good – especially on a chilly day like today! My favorite little bites has always been blueberry. 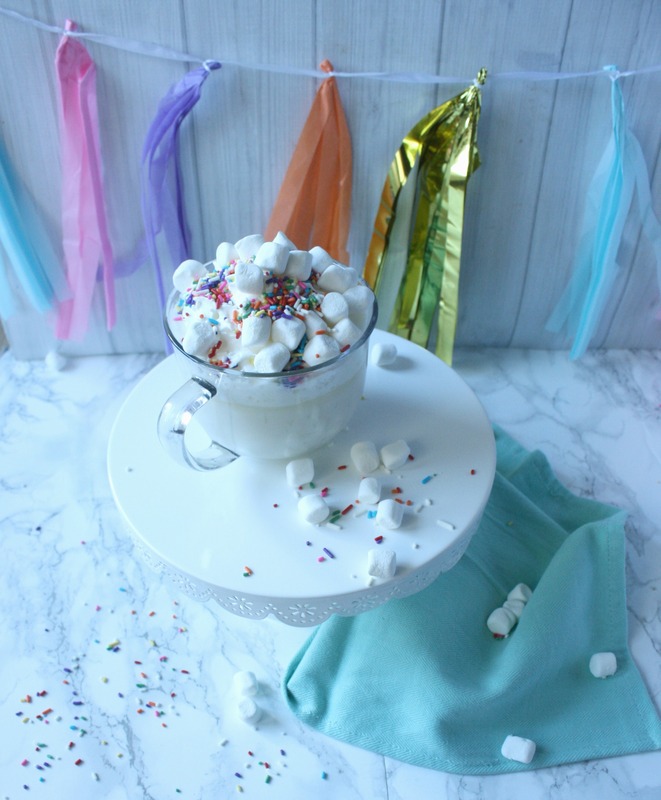 Your Party Cake Hot Chocolate looks so pretty and delicious! I want to try the Blueberry bites.They look so delicious! My grandson is your biggest fan of the Brownie Bites! I love this giveaway! The Little Bites Crumb Cake. Thank you for the chance. The little bites Crumb Cakes are so good. I have my son hooked on them too. This is such a cute idea, my son loves party cake anything so will definitely be trying this out. We don’t carry Little Bites here but I’d like anything chocolate. I like that you added sprinkles to the hot chocolate. My favorite flavor is Crumb Cake. The little Bites seasonal pumpkin bites! I love the bownie bites the best perfect size. What a yummy after school snack. My grandkids would like this. Blueberry muffins are always a HUGE hit! I love the Little Bites® Fudge Brownies. I love the blueberry muffins, they are great. My grandson loves Chocolate Chip Little Bites. Little Bites Brownies are my favorite! Snicker doodles are a favorite in this house. I’d like to try the crumb cakes! I like the brownie bites! I like the coffee cake ones but my daughters love the Birthday cake kind. My favorite are the brownie bites!! If you twist my arm to choose just one I would say the fudge brownie but the crumb cakes are awesome too! I have been eating Entenmanns since I was a kid, that is a long time I can not wait to try your delicious pairing of Party Cake Hot Chocolate and Entenmann’s® Little Bites® Party Cakes!. My favoruite Little bites are the Snickerdoodle. They are just so good. My daughters favorite are the Party Little Bites. I love the brownie bites best. My favorite ones are the blueberry muffins. Thanks for the yummiest recipe. Blueberry muffins are my favorite, also my 3 year old great granddaughters. Chocolate Chip Little bites Are my favorite. The hot chocolate with all those marshmallows lots amazing. I prefer plain old chocolate chip! My daughter really likes the confetti cake ones though. The banana ones are my favorite. But they are all good, I want to try the crumb cake ones. The Little Bites Blueberry Muffins are my fave! Blueberry Muffins are my favorite! I love the Fudge Brownies Little Bites. Little Bites® Fudge Brownies, These are my fav! The banana muffins sound the best. Brownie bites! Can you tell I’m a chocolate lover?? The chocolate chip muffins are definitely my favorite! I love the Little Bites Fudge Brownies. I most love their chocolate chip muffins -yum! I love the banana bites. I’m fond of Blueberry Muffin Little Bites by Entenmann and have been taking them of trips as they travel well and are portion controlled. We really like the Little Bites chocolate chip muffins. Butter Cookie sounds so good! Little Bites® Butter Cookie Muffins would be first pick for me! My little ones live little bites. I had no idea they would only be made until May. Party cakes our my favorite but my kids like all of them. My favorite is Little Bites Chocolate Chips Muffins. I don’t think I’ve ever had any before, but crumb cakes looks the best. This sounds delicious, definitely going to try it. fudge brownie is our favorite. I like the banana nut muffins from Little Bites. We love Entenmann’s. This sounds yummy! Little bites Chocolate chip is my favorite flavor. This sounds like its going to be my new favorite flavor! My favorite are the blueberry, my kids love the chocolate chip ones. Saving this one for Gramma and Granddaughter movie night. I am always looking for new snacks for us. Thank you for sharing. These are great! My favorite are definitely the Little Bites® Party Cakes! Sounds like a fancy, yummy hot chocolate recipe. I like the blueberry muffins! Yum! This sounds like a great winter drink! Blueberry has always been my favorite – since I was a child. I love the Chocolate chip and blueberry muffins. I like the 24 count Muffin Lover’s Variety Pack the most of all of the fine Little Bites choices available on the website. I like their Crumb Cakes! My favorite flavor is the Chocolate Chip. I like the Little Bites Blueberry Muffins. My kids love the fudge brownies… I haven’t tried the party cakes yet – sounds yummy! The Little Bites Crumb cakes have a special place in my heart. so attractive and festive looking, yummy! I love the Little Bites Crumb Cake. My favorite are the Little Bites Blueberry Muffins! I didn’t know that Entenmann’s Little Bites contain no high fructose corn syrup, Love that! Blueberry would be my favorite!!! They are hard to find around here….so we haven’t tried any. But I would love to try the chocolate chip and the crumb cake ones look yummy!! He likes the blueberry I like the chocolate chip. I like the Brownie Bites the most of all of the fine varieties of Little Bites. The chocolate chip is my favorite. Thanks for hosting! The hot chocolate looks yummy! We love the Chocolate Chips Muffins. I like the blueberry muffin! I LOVE THE chocolate chip and i love the pumpkin when in season!! they are all good really and the perfect amount in the bag! We have our eye on those crumb cakes ! I love the Little bites Crumb cake it’s my fave. Brownie Bites are my favorite. I do love Entenmann’s snacks. I like the brownie bites because they taste so good but I like them all basically. I want them all.